The word “pancreas” is bound to appear somewhere in this issue of diaTribe, and is probably found in every issue that precedes it. That is because diabetes is often thought of as a disease of blood sugar, insulin, and the organ directly in charge of insulin secretion - the pancreas. Yet I’ve never once met anyone with diabetes who came to the hospital saying, “my pancreas is acting up again.” Diabetes affects every single organ in the body, and most of the time it’s complications of diabetes in other organs that send people with diabetes to the hospital. Appreciating how diabetes affects other organs is essential to understanding how to avoid diabetes complications and for comprehending why blood sugar control is so important. The good news is that with appropriate prevention, screening, and treatment, many people with diabetes can avoid diabetes complications altogether. High blood sugar is believed to cause microvascular complications of diabetes in three different ways: 1) high blood sugar can directly cause damage by sticking to the proteins that are the building blocks of the tissues, forming what are called “advanced glycosylated end products (AGEs)”; 2) high blood sugar can cause “free radicals” and “reactive oxygen species” – the opposite of “antioxidants” – that can damage or destroy cells; and 3) high blood sugar can lead to the accumulation of sugar-alcohol in cells such as sorbitol, which stresses cells and causes them to swell with water. I’ve intentionally used the term “high blood sugar,” rather than diabetes, because the eyes, kidney, and nerves don’t know whether or not a person has diabetes. High blood sugar, not diabetes, is the main cause of damage. When blood sugar is well controlled, the rate of diabetes complications falls dramatically. For example, in the Diabetes Control and Complications Trial (DCCT), a landmark trial that was conducted from 1983 to 1993 in people with type 1 diabetes, there was a 60% reduction in kidney and eye damage in people treated to an A1c of 7.0% compared to an A1c of 9.0%. In type 2 diabetes, a 1% decrease in A1c has been shown to cause a 37% decrease in the risk in eye or kidney complications. Diabetic retinopathy is a potential complication from diabetes that involves damage to the small blood vessels of the eye leading to blurry vision. 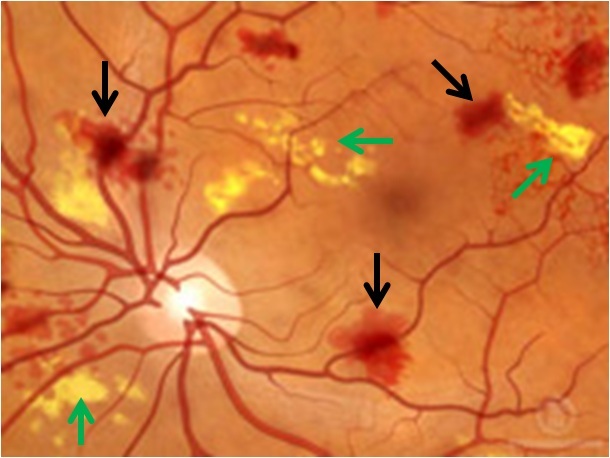 Advanced signs of diabetic retinopathy include pale "cotton wool spots" (green arrows) and "hemorrhages" (black arrows) on the retina of the eye. The A1c (widely referenced in this article) is a test that reflects your average blood glucose level for the prior two to three months. A goal of less than 7.0% is desirable for most people with diabetes, which corresponds to an average blood glucose level of 150 mg/dl. However, more or less stringent A1c goals may be appropriate for some people with diabetes. Some people believe striving for a more “normal” level is appropriate, especially if they have access to CGM, which can help significantly in recognizing signs of or in helping avoid hypoglycemia. People with diabetes should receive an annual comprehensive eye examination by an ophthalmologist or optometrist (less frequent exams may be appropriate for some people), an annual urine screening for albumin (a protein that when present in the urine can be a sign of kidney disease), and annual comprehensive foot examinations. Never cut off calluses or corns on the feet (calluses may safely be controlled by rubbing a wet pumice stone daily using a lotion after using the stone), and wear well-fitting protective shoes. People with diabetes should monitor blood pressure and cholesterol, and should aim for a blood pressure level below 130/80 mmHg and LDL cholesterol (the bad kind of cholesterol) of less than 100 mg/dl. Our knowledge and understanding of diabetes and its complications is continually growing, and the available treatment options for diabetes have improved over the years. With careful self-management and support from your healthcare provider team, serious complications of diabetes can be avoided. Although glucose control will always be the best way to reduce diabetes complications, a number of breakthroughs in the management of diabetes complications are on the horizon. These include a remarkable anti-inflammatory therapy called bardoxolone methyl that has shown great promise in treating chronic kidney disease caused by diabetes, and several new treatments for diabetic macular edema including Roche’s Lucentis (already approved for age related macular edema). We look forward to reporting on the development of these and other therapies for diabetes complications in the months ahead. For more information on complications of diabetes, please visit: http://diabetes.niddk.nih.gov/complications/index.aspx.